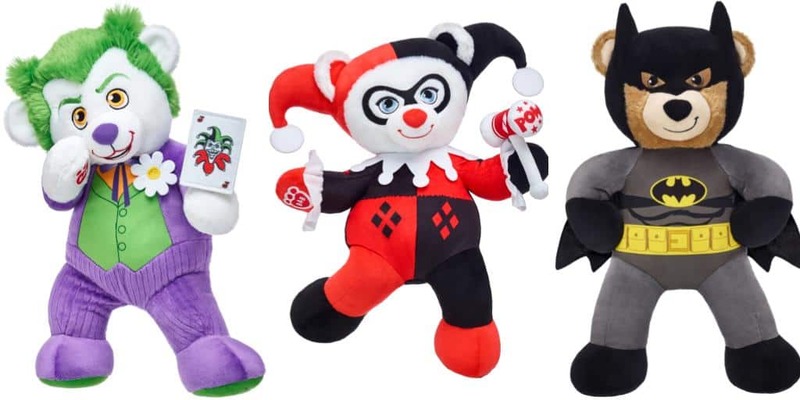 Build-A-Bear Unveils Joker and Harley Quinn | Nerd Much? Joker Bear looks very creepy, there’s no denying it. Build-A-Bear, in celebration of the upcoming Batman Day, have launched Harley Quinn and Joker bears to their collection. They are online only and available now for $35 USD each. Also to be added are three Justice League characters, Batman, Wonder Woman, and Superman. The latter three will be available mid-October for $28 USD each, though no exact date was mentioned. Batman will launch in-stores along with a sold separately Batmobile plush. Wonder Woman and Superman will be online only. If you purchase either Joker or Harley Quinn, you will receive a bonus Superhero Girls Batman Day comic, only while supplies last of course. The pictured wrist accessories for Joker (the playing card) and Harley Quinn (her famous mallet) are not sold separately, so don’t worry about any extra cost. All that said: the Joker Bear looks very creepy, there’s no denying it. Something about those eyebrows and that stiff yet sinister smile. Why so serious indeed. Regardless if that was the intention, I’m not sure how appropriate for children these characters are. Depending on the age range of course, though there isn’t one listed with these bears. These characters have backgrounds and storylines that might not be a good fit for children under the age of 8 years old, if that. Granted, both Joker and Harley Quinn are their old school versions from the comic books and TV shows. Luckily not Jared Leto’s version. No, instead this Joker has the iconic purple suit and the daisy I remember too well from Jack Nicholas’ version of the Joker. Not that Michael Keaton made a good Batman, but Nicholas made a great Joker. He may also be the reason so many fans began to theorize about the exact relationship between Batman and the Joker, but that could have been the Dark Knight too.